A heuristic is a fallible method for solving a problem or making a decision. “Heuristic” as an adjective means “something that helps us to learn”. In testing, an oracle is a heuristic principle or mechanism by which we recognize a problem. Some years ago, during a lunch break from the Rapid Software Testing class, a tester remarked that he was having a good time, but that he wanted to know how to get over the boredom that he experienced whenever he was testing. I suggested to him that if found that testing was boring, something was wrong, and that he could consider the boredom as something we call a trigger heuristic. A trigger heuristic is like an alarm clock for a slumbering mind. Emotions are natural trigger heuristics, nature’s way of stirring us to wake up and pay attention. What was the boredom signalling? Maybe he was covering ground that he had covered before. Maybe the risks that he had in mind weren’t terribly significant, and other, more important risks were looming. Maybe the work he was doing was repetitive and mechanical, better left to a machine. Somewhat later, I realized that every time I had seen a bug in a piece of software, an emotion had been involved in the discovery. Surprise naturally suggested some kind of unexpected outcome. Amusement followed an observation of something that looked silly and that posed a threat to someone’s image. Frustration typically meant that I had been stymied in something that I wanted to accomplish. There is a catch with emotions, though: they don’t tell you explicitly what they’re about. In that, they’re like this device we have in our home. It’s mounted in a hallway, and it’s designed to alert us to danger. It does that heuristically: it emits a terrible, piercing noise whenever I’m baking bread or broiling a steak. And that’s why, in our house, we call it the cooking detector. The cooking detector, as you may have guessed, came in a clear plastic package labelled “smoke detector”. When the cooking detector goes off, it startles us and definitely gets our attention. When that happens, we make more careful observations (look around; look at the oven; check for a fire; observe the air around us). We determine the meaning of our observations (typically “there’s enough smoke to set off the cooking detector, and it’s because we’re cooking“); and we evaluate the significance of them (typically, “no big deal, but the noise is enough to make us want to do something”). Whereupon we perform some appropriate control action: turn on the fan over the stove, open a door or a window, turn down the oven temperature, mop up any oil that has spilled inside the oven, check to make sure that the steak hasn’t caught fire. Oh, and reset the damned cooking detector. 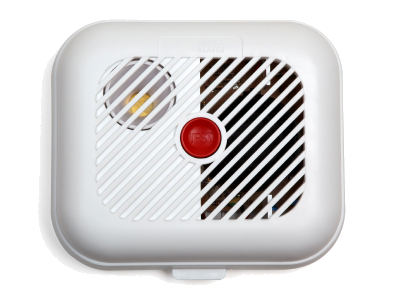 Notice that the package says “smoke detector”, not “fire detector”. The cooking detector apparently can’t detect fires. Indeed, on the two occasions that we’ve had an actual fire in the kitchen (once in the oven and once it the toaster over), the cooking detector remained resolutely and ironically silent. We were already in the kitchen, and noticed the fires and put them out before the cooking detector detected the smoke. Had one of the fires got bad enough, I’m reasonably certain the cooking detector would have squawked eventually. That’s a good thing. Even though our wiring is in good shape, we don’t smoke, and the kids are fire-aware, one never knows what could happen. The alarm could give us a chance to extinguish a fire early, to help to reduce damage, or to escape life-threatening danger. The cooking detector is like a programmer’s unit test—an automated check. It makes a low-level, one-dimensional, one-bit observation: smoke, or no smoke. It’s oblivious to any threat that doesn’t manifest itself as smoke, such as the arrival of a burglar or a structural weakness in the building. The maximum value of the cooking detector is unlikely to be realized. It occasionally raises a ruckus, and when it does, it doesn’t tell us what the ruckus is about. Usually it’s for something that we can understand, explain, and deal with quickly and easily. Smoke doesn’t automatically mean fire. The cooking detector is an oracle, a device that provides a heuristic trigger, and heuristic devices are fallible. The cooking detector doesn’t tell us that there is a problem; only that there might be a problem. We have to figure out whether there’s a problem, and if so, what the problem is. Yet the cooking detector comes at low cost. It didn’t cost much to buy, it takes one battery a year, and it’s easy to reset. More importantly, the problem to which it alerts us is a potentially terrible problems. Although the cooking detector doesn’t tell us what the problem is, it tells us to pay attention so that we can investigate and decide on what to do, before a problem gets serious without our notice. Smoke doesn’t automatically mean fire, but it does mean smoke. Where there’s smoke, maybe there’s fire, or maybe there’s something else that’s unpleasant or dangerous. The cooking detector reminds us to check the steak, open the windows, clean the oven every once in a while, evaluate what’s going on. I don’t believe that the cooking detector will ever detect a real, serious problem that we don’t know about already—but I’m not prepared to bet my family’s life on that. There is a common claim, especially in the Agile community, that suggests that all testers should be able to write programs. I don’t think that’s the case. In the Rapid Software Testing class, James Bach and I say that testing is “questioning a product in order to evaluate it”. That’s the short form of my personal definition of testing, “investigation of people, software, computers, and related goods and services, and the relationships between them”. Most people who use computer programs are not computer programmers, and there are many ways in which a tester can question and investigate a product without programming. Yet there are at least three very good reasons why it might be a good idea for a tester to learn to program. Tooling. Computer programs extend our capacity to sense what’s happening, to make decisions, and to perform actions. There are many wonderful packaged tools, in dozens of categories, available to us testers. Every tool offers some level of control through a variety of affordances. Some provide restrictive controls, like text fields or drop-down lists or check boxes. Other tools provide macros so that we can string together sequences of actions. Some tools come with full-blown scripting languages that provide the capacity for the tester to sense, decide, and act through the tool in very flexible and specific ways. There are also, of course, general-purpose programming and scripting languages in their own right. When we can use programming concepts and programming languages, we have a more powerful and adaptable tool set for our investigations. Insight. When we learn to program, we develop understanding about the elements and construction of programs and the computers on which they run. We learn how data is represented inside the computer, and how bits can be interpreted and misinterpreted. We learn about flow control, decision points, looping, and branching—and how mistakes can be made. We might even be able to read the source code of the programs that we’re testing, which can be valuable in review, troubleshooting, or debugging. Even if we never see our programs’ source code, when we learn about how programs work, we gain insight into how they might not work. Humility. Dan Spear, a great programmer at Quarterdeck and a good friend, once pointed out to me that programming a computer is one of the most humbling experiences available to us. When you program a computer to perform some task, it will reflect—often immediately and often dramatically—any imprecision in your instructions and your underlying ideas. When we learn to program, we get insight not only into how a program works, but also into how difficult programming can be. This should trigger respect for programmers, but it should also trigger something else: empathy, which—as Jerry Weinberg says—is the first and most important aspect of the emotional set and setting for the tester. Can You Test a Clock in a Sealed Box? A while ago, James Bach and I did a transpection session. The object of the conversation was to think critically about the common trope that every test consists of at least an input and an expected result. We wanted to go deeper than that, and in the process we discovered a number of useful ideas. A test can be informed by an expectation, but oracles can also be developed on the fly. Oracles can also be applied retrospectively, after the test has been “completed”, such that you never know when a test ends. James has a wonderful example of that here. We also came up with the notion of implicit and explicit inputs, and symbolic and non-symbolic inputs. As the basis of our chat, James presented the thought experiment of testing a clock that you can’t get at. Just recently my friend Adam White pointed me to this little gem. Enjoy!